Poorly designed SharePoint and Office 365 applications can contain vulnerabilities that expose your SharePoint environment to risks. Take our Free Risk Assessment to understand how your SharePoint applications are built and whether they contain any harmful code. Your data is at risk! Your organization extends SharePoint and Office 365 to tailor it to your business needs by adding applications. SharePoint applications range from small scripts, forms and workflows to bespoke applications built by professional developers. No matter the type, applications put your organization's data at risk by communicating with external services and using unverified third-party building blocks. Vulnerabilities in SharePoint applications open the doors to malware, spam, phishing, and loss of confidential data. Your business could lose intellectual property, acquire legal fines, lose competitive advantage and company image. 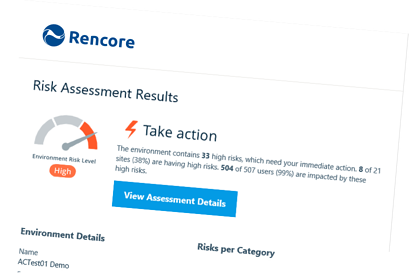 Take our free Risk Assessment to find what SharePoint applications are used in your organization, what risks they pose and how you can mitigate them. Make an action plan today to avoid vulnerabilities. The Rencore platform scans your SharePoint and Office 365 environment and discovers all applications ranging from scripts, forms, workflows, to applications built by professional developers. Our powerful analysis engine assesses your SharePoint application risks and shows you the threats they pose to your organization. Using the detailed information you make an action plan for your organization to mitigate the risks before they become a problem.